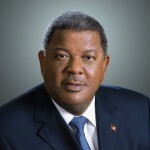 Winston Baldwin Spencer is the Prime Minister of Antigua and Barbuda. He has been Prime Minister since March 24, 2004, when his party, the United Progressive Party, which he had led as the opposition party for several years, won a parliamentary election. He has also been Minister of Foreign Affairs since January 6, 2005. In 1992, Spencer played an integral role in the formation of the United Progressive Party. He previously served as a leader with the United National Democratic Party and spearheaded collaborative meetings with the Antigua Caribbean Liberation Movement that resulted in the formation of the United Progressive Party. On 16 August 2008, Spencer was inducted as an honorary member of the Pathfinder Club, a Seventh-day Adventist youth service organization. Antigua Prime Minister Baldwin Spencer received the ranking during a gathering of more than 3,000 Pathfinders from around the Caribbean.